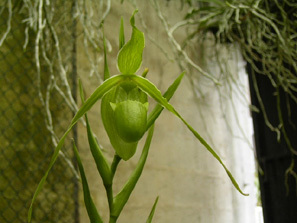 "Fox Valley Orchids, Ltd. is a small independent orchid nursery specializing in tropical Lady's Slipper orchids. 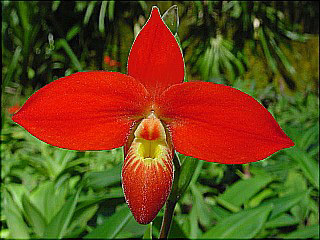 We do not sell native Lady's Slipper orchids (Cypripediums) nor do we have the necessary permits at this time to ship our product outside the U.S."
We propagate rare and desirable Paphiopedilum and Phragmipedium species and unusual hybrids for the domestic market. Our hybridizing program is focused on the creation of compact growing Phrag. hybrids with large, brightly colored flowers – things that are rarely offered by large commercial orchid growers because of the limited number of seedlings produced. We attend several orchid shows every year ( and encourage pre-orders to save on shipping costs). Among these are the Orchid Growers Guild Show in Madison, WI, in early February, the Michigan Orchid Society Spring Show in Madison Heights, MI, the Greater Cincinnati Orchid Society Spring Show and the Illinois Orchid Society Spring Show in Glencoe, IL.